LAVAL, Quebec, April 03, 2018 (GLOBE NEWSWIRE) -- Urbanimmersive Inc. (“Urbanimmersive” or the “Corporation”) (TSX VENTURE:UI.V) (OTC PINK:UBMRF), the real estate content marketing platform, and Tourbuzz, LLC (“Tourbuzz”), the leading real estate photographer software solution provider in North America, are pleased to announce that the two companies have signed a binding letter of intent (the “LOI”) on March 30, 2018, for the acquisition of Tourbuzz by Urbanimmersive (the “Transaction”), subject to the conditions contained therein which are summarized below. 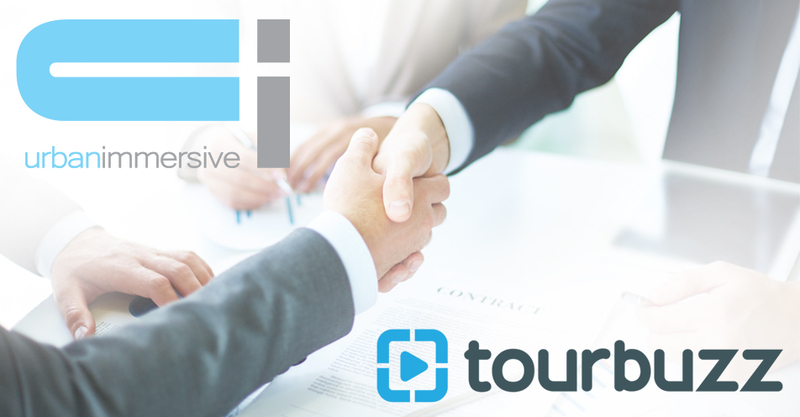 Under the terms of the LOI, Urbanimmersive would acquire 100% of the limited liability company interests in Tourbuzz, which are held by the two founders, Messrs. Alan Pinstein and Paul Rodman, for a consideration of US $3,500,000 to be paid in cash at closing. The Transaction would allow Urbanimmersive to acquire the Tourbuzz software and all related customer contracts representing thousands of photographer businesses located across the United States and Canada, as well as in Great Britain and Australia, performing approximately 250,000 (pay per transaction) photoshoots annually using Tourbuzz solutions. The Transaction is expected to increase the revenues of Urbanimmersive in the short term. According to its unaudited financial statements for the 12-month period ended December 31, 2017, the total revenues of Tourbuzz in its 2017 fiscal year were approximately seven times larger than Urbanimmersive’s revenues for its fiscal year ended September 30, 2017. Urbanimmersive estimates that Tourbuzz’ gross margin for its 2017 fiscal would be of approximately 94%, compared to a gross loss by Urbanimmersive in its 2017 fiscal year. Still according to its unaudited financial statements for the 12-month period ended December 31, 2017, Tourbuzz’ operating results generated 7% net profits in its 2017 fiscal year, and Tourbuzz does not have any long-term liabilities. “This is a game-changer opportunity for Urbanimmersive. This Transaction is aligned with our objective to become the leading and fastest growing real estate content marketing platform in North America and to enhance our overall reach and technological solutions” commented Ghislain Lemire, Chief Executive Officer of Urbanimmersive. “This Transaction would also provide Urbanimmersive with immediate access to highly skilled and experienced engineering and customer support teams to rapidly join Urbanimmersive’s actual staff developing and supporting similar solutions. Most importantly, we expect the Transaction to significantly increase revenues, positively impact operating results in short-term while providing long-term growth opportunities”, added Ghislain Lemire. Completion of the Transaction remains subject to a number of conditions, including the completion of a satisfactory due diligence investigation by Urbanimmersive, the negotiation of a definitive purchase agreement, the receipt of all required regulatory approvals, including of the TSX Venture Exchange, Urbanimmersive obtaining financing for the Transaction on acceptable terms and such other closing conditions as are customary in transactions of this nature. There can be no assurance that such conditions will be satisfied and that the Transaction will be completed as described or at all. Established in 2008 and based in Atlanta, Georgia, USA, TourBuzz LLC. (www.tourbuzz.net) is the leading real estate photography software solution. Tourbuzz solutions are used by more than 1500 photographer businesses across the United States and Canada, as well as in Great Britain and Australia, performing approximately 250,000 (pay per transaction) photoshoots annually. Tourbuzz’s photographers have uploaded to date more than 32 million photos including videos and panoramas. Urbanimmersive is a content marketing platform for real estate professionals. The Corporation connects real estate professionals, photographers, and writers in order to simplify and optimize original content production workflow. Urbanimmersive enables its customers to leverage their marketing investment while increasing productivity, competitiveness, their web visibility, consumer engagement with their brand and ultimately, their revenue. Certain statements in this news release, other than statements of historical fact, are forward-looking information that involves various risks and uncertainties. Such statements relating to, among other things, the anticipated benefits of the Transaction for Urbanimmersive, the prospects for the Corporation to enhance operating results; completion and expected timing of the Transaction; whether the terms of the Transaction will be as described in this press release; whether the Transaction will be successful; the receipt of required regulatory approvals (including stock exchange) in respect of the Transaction; are necessarily subject to risks and uncertainties, some of which are significant in scope and nature. These uncertainties may cause actual results to differ from information contained herein. There can be no assurance that such statements will prove to be accurate. Actual results and future events could differ materially from those anticipated in such statements. These and all subsequent written and oral forward-looking statements are based on the estimates and opinions of the management on the dates they are made and expressly qualified in their entirety by this notice. The Corporation assumes no obligation to update forward-looking statements should circumstances or management estimates or opinions change. For additional information with respect to certain of these and other assumptions and risk factors, please refer to the last Corporation's MD&A filed with the Canadian securities commissions. The forward-looking statements contained in this press release represent our expectations as of the date hereof. We disclaim any intention and assume no obligation to update or revise any forward-looking statements.